This "Ferrari" RC Turbine Jet Can Reach 400 KMH (250MPH)! - Muscle Cars Zone! This “Ferrari” RC Turbine Jet Can Reach 400 KMH (250MPH)! We are always feeling excited when a new realistic toy is made and in the following video we take a look at such amazing toy, though we can`t say it is a toy, which is called the Wild Hornet RC Turbine Jet. The whole built was probably sponsored by Ferrari hence it has the name on its wings as well as the classic red color. They interview the man at a RC toys event called the Modellflugtreffen located in Rehfelde, Germany. The event was organized back in June 2016. After finishing the interview we can finally see the RC Turbine Jet in action. It looks super realistic and its engine makes such noise as you would expect to find in a normal size turbine jet. Let`s take a look at some of its specs and details about the engine itself. It was developed and constructed by Jet Arrows. Its wingspan is 1,70m and its length 1,65m. Surprising enough, this little monster can hold up to 2 liters of kerosene as its fuel. The engine is called the IQ Hammer 130+ and is capable of reaching speeds of up to 400 km/h. This is surprisingly fast for such small scale model. The take-off weight is just 11kg. Bernard Breitkreuz is the pilot of the plane and he seems to handle it perfectly. We can see the RC Turbine Jet in action and it is a spectacular sight to experience. 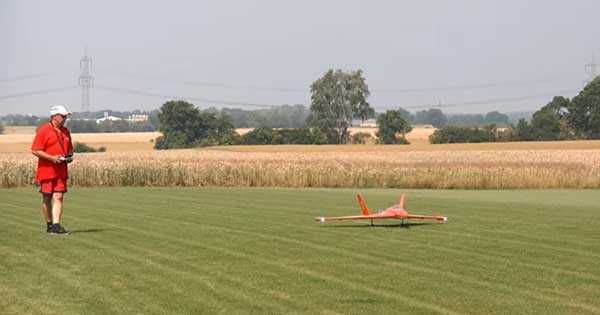 What do you think, is it possible to find such super realistic RC plane? Finally, check out these RC Planes!